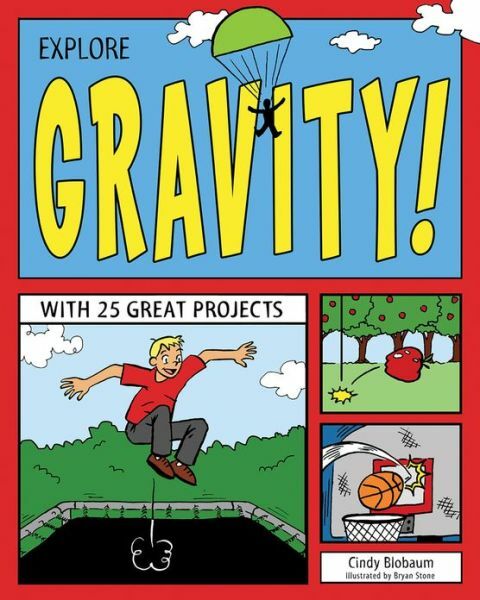 Packed with kid-friendly information and complemented with hands-on, minds-on projects, Explore Gravity! With 25 Great Projects is sure to cause young readers on the fourth grade level to stop, think, and experiment with a concept that is so universal it is often ignored. Play is one of the most powerful teachers, and Explore Gravity! encourages scientific play. The suggested activities are simple (dropping items from different heights) yet fun (creating a marshmallow launcher). The book will inspire children to fiddle with physics, all in the name of fun. In addition to the emphasis on data collection, inquiry and scientific process skills, teachers will appreciate the wide array of concepts addressed including life science (the impacts of gravity on sprouting plants and the anatomy of the inner ear), space science (black holes and orbits), health (exercises and survival in an avalanche), and of course physical science (simple machines and centripetal force). Those who are working to add informational text to their reading lists may want to consider this book. Parents will like that the activities require only household items, and can be accomplished with minimal adult support. Kids will like the jokes, fun facts (like how many Gs a person experiences in a roller coaster, Formula One Race Car or space ship), and the knowledge which they can apply in everyday life. Explore Gravity! is listed as appropriate for grades 1-4. While many of the activities in the book are most appropriate for students on the lower end of that range, the reading level is more appropriate for readers on the upper end and beyond that range. Explore Gravity! includes black and white illustrations which either clarify the instructions (for example a labeled diagram of the inner ear) or add humor. Many spreads include a “Words To Know” sidebar with bolded words and definitions. The back matter contains a glossary and index.